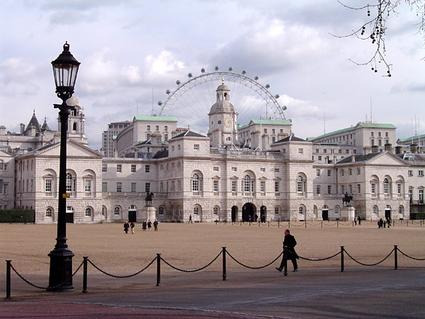 Parade ground where the daily Changing of the Life Guard, and the annual Trooping of Colour, take place. Horse Guards Parade is just off Whitehall and provides a quintessentially British experience every year on Elizabeth II's birthday, when the Trooping of Colour - various royal regiments and massed bands - march across the Horse Guards and display the colours of their uniforms and banners. This is also the place where the Changing of the Queen's Life Guard takes place; this guard is mounted, whereas the more famous Changing of the Guard at Buckingham Palace is the Queen's Guard, which consists of soldiers on foot. Twelve mounted troops arrive at the Parade Ground from Hyde Park Barracks, via Hyde Park Corner, Constitution Hill and The Mall. When the Queen is resident in London, an officer, a corporal of horse, 16 troupers and a trumpeter on a grey horse take part in the ceremony. All of the Guards are serving soldiers in one of seven regiments: the Household Cavalry Regiment; the Life Guards and the Blues and Royals and the five foot regiments; the Grenadier Guards; the Coldstream Guards; the Scots Guards; the Irish Guards and the Welsh Guards. The guards change over when they have finished duty. The Grenadiers, Coldstream, Scots, Irish and Welsh Guards wear the iconic Bearskin hats (weighing 665g), red tunics and white belts. Their regiments are identified by the colour and position of the plume in their caps and the pattern of their buttons. 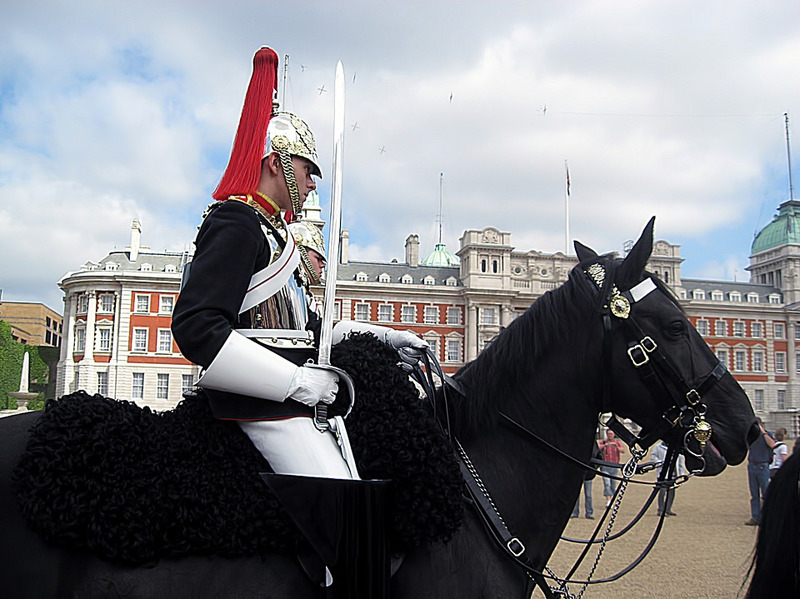 The Life Guards (white plume, red tunic) and Blues & Royals (red plume, blue tunic) wear metal helmets and breastplates. These Household Troops have guarded the Sovereign since the time of Henry VII. In August and at other times of the year, other regiments sometimes guard the Queen in place of the traditional Guards. The changing of the Life Guard takes place every day at 11:00 on weekdays and at 10:00 every Sunday.